As new streaming services continue to enter the market, consumers are faced with more choices around what to watch than ever before. But while there’s been a lot of industry buzz around using recommendation engines to help consumers find new content, AT&T has found that the vast majority of engagement on DIRECTV NOW is habitual. 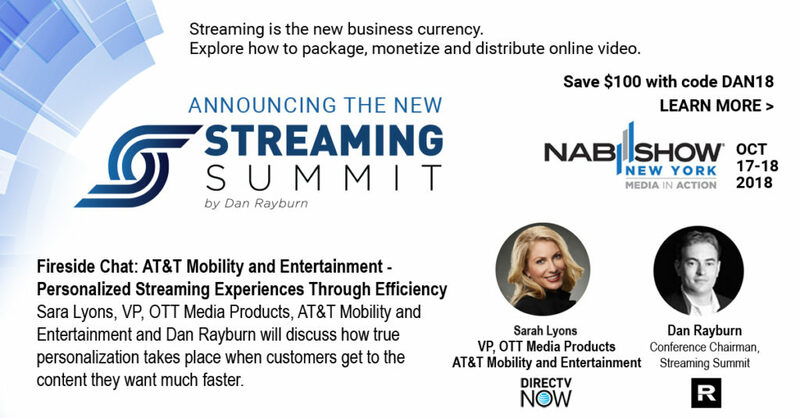 At the Streaming Summit, taking place as part of the NAB Show New York on Oct. 17-18th, Sarah Lyons, VP, OTT Media Products, AT&T Mobility and Entertainment will join me in a fireside chat to explore how true personalization takes place when streaming services can help customers get to the content they want much faster, while using data to understand the right time and way to introduce new content.